Open, read, view, review and print Adobe PDF files, and convert PDF to TXT, BMP, JPG, GIF, PNG, TIF, TIFF, WMF, EMF, EPS, TIFF with this lightweight yet full-featured free PDF viewer as an alternative to Microsoft Windows Reader. For more information on business and commercial use, learn more about the commercial license. The software supports zoom in and zoom out, page rotation, and PDF slide show, and it can be added to Windows 8 as a built-in PDF browser. Designed and certified for Microsoft Windows 8 64-bit and 32-bit. As compared to Microsoft Windows Reader, this PDF reader loads itself lightening fast, and opens almost any PDF files within a second or two. It's an ideal PDF viewer for Microsoft Windows 8, and you can even associate the software with the PDF file type on your system. A special feature of this PDF reader is copying text and graphics contents in any selected region in any PDF page is easy with a few mouse clicks. The other special feature of this PDF reader is slideshow. You can browse your PDF document in the way just as you show your Microsoft PowerPoint slides. You can read your PDF document in the way just as you show your Microsoft PowerPoint slides. 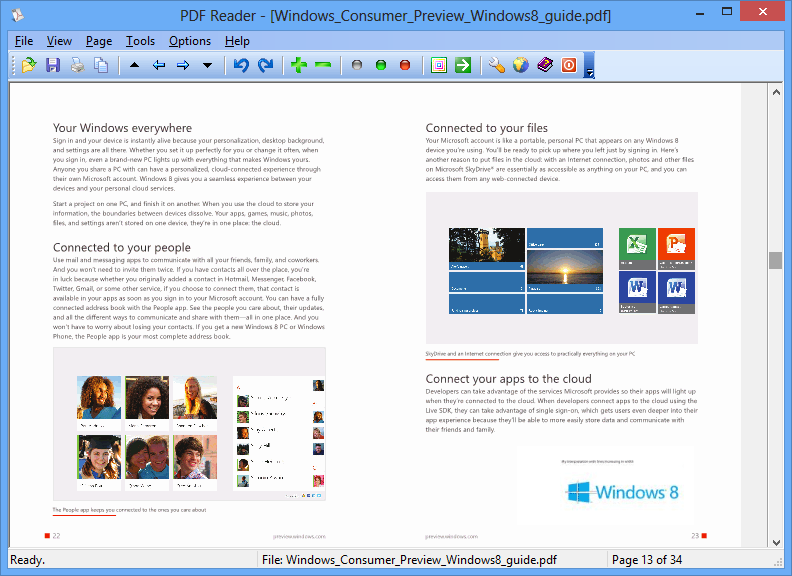 PDF Reader for Windows 8 is not a Metro UI application, instead, it is written in high performance native code, and therefore you don't have to switch from your classic Windows Desktop to the Metro UI when you open or view a PDF document anywhere on your Desktop, in your Library, or from your My Documents folder. Open, read, view, review, print and edit Adobe PDF files, and convert PDF to TXT, BMP, JPG, GIF, PNG, WMF, EMF, EPS, TIF, TIFF with this lightweight yet full-featured free PDF viewer as an alternative to Microsoft Windows Reader.